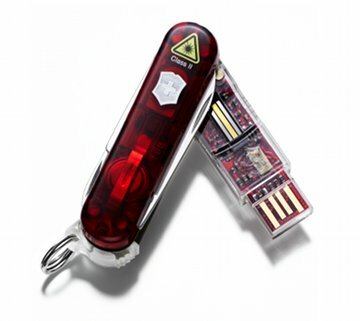 Victorinox Launches Swiss Army Flash Drive - Unhackable? I've always thought the Swiss Army flash drives were way cool. The whole idea of a Swiss Army knife gets most geeks ready to pull out a credit card. Then came the idea of putting a jump drive in the knife and my "geek-o-meter" went off the scale. Well imagine my reaction when I learned today that the Victorinox company, makers of the Swiss Army knife, have released a new version called The Victorinox Secure Pro. This device isn't just a flash drive in a knife like the older models were. This one has some security features that has prompted the company to offer a prize of £ 100,000 to anyone who can hack it. The device features AES256 encryption as well as a fingerprint reader and, get this, a thermal and oxygen sensor that can tell whether the finger is still attached to its owner or not.The device will sell for £100 for an 8GB model and £245 for a 32GB model. Amazing technology and the price isn't too bad. The only drawback for me is that the software to run it is Windows only currently. One of the great things about technology is is the ability to be more efficient while increasing what you do. There are many ways in dentistry to do this. One of the best things I've seen for the administrative staff is to use Lighthouseplz. Lighthouse keeps us in constant contact with our patient base. It interfaces with our practice operating system, Eaglesoft and frees the admin team to concentrate on other aspects of their responsibilities. We rarely do confirming phone calls anymore. Since we have patient e-mail addresses and mobile phone numbers in the Eaglesoft database it's easy. Lighthouse interfaces remotely with our database and sends e-mail and mobile phone messages to confirm appointments. That alone is pretty cool, but Lighthouse also works the process in reverse as well. By interfacing with Eaglesoft, when a patient electronically confirms, Lighthouse goes into Eaglesoft and marks their appointment as confirmed in the software. The admin team doesn't have to do anything! The appointments simply show up in the schedule as "confirmed". Lighthouse also sends out patient satisfaction surveys, newsletters, and much more. For the full story, check out their website. You'll be glad you did. Behold the AR Drone. This four propeller helicopter can fly, hover, and even send images from its nose mounted camera. The best part? You can control it from your iPod Touch or iPhone. The camera sends views back to your controlling device as well as providing you with a HUD (Heads Up Display). No word on cost yet, but it should be available in 2010. If you're interested in purchasing, you can monitor the website. Read on for all the details. In January 2010, we unveiled the Parrot AR.DRONE, the first ever flying Unmanned aerial vehicle (UAV) with Augmented Reality. A DRONE HELICOPTER EVEN A CHILD CAN PILOT! For the first time an affordable helicopter will come with stabilized fly model, making it so easy to pilot even a child can control it. Thanks to its Microelectromechanical systems (MEMS), Digital Signal Processor (DSP), Inertial measurement unit (IMU) and sensors, the Parrot AR.DRONE turns complex fly patterns into an easy-to-pilot system. Children will pilot AR.DRONE instinctively, using the iPhone, without any learning curve. This allows for an incredible fly experience and acrobatics. While the iPhone will display the HUD, controls, animations and sounds, the Parrot AR.DRONE will fly around you. Stop moving your iPhone and the AR.DRONE will stay put, steady, balancing its engines to fly as well as a hummingbird. The AR.DRONE can play solo games with Augmented Reality, relying on 2D or 3D gametags in the real world to create virtual tracks or display virtual enemies. Even better, a multiplayer demo experience is built-in: the "Drone War" allowing 2 AR.DRONE to compete for air supremacy, with virtual lasers and missiles! By registering on Ardrone.org, you will be able to download the SDK, buy a AR.DRONE flying kit and start developing great and innovative video games. Thanks to the Open Game API we provide, your projects will change the way video games are played, both indoor and outdoor. In the continuing saga of large companies failing to keep data safe, comes this story. Educational Credit Management Corp has admitted that information on 3.3 million people has been stolen from its headquarters. Rather than try and explain the whole thing, here is a link to the story on Foxnews.com. Every once in a while I stumble across a product that is a "slap your forehead" kind of thing because it's so simple and solves a common problem and I wonder "why didn't I think of that?" The Zomm is that kind of product. In February I was at the Chicago Midwinter Dental Meeting and I was on my way to an event hosted by Danaher on the 99th floor of the Sears Tower. The building is considered a national landmark, and as such, you are screened before entering. It's similar to what you go through in airports. As I stepped up, I reached for my Palm Pre mobile phone only to realize it wasn't in my pocket. I panicked, as my entire life was in that phone. I had just gotten out of cab, was it rolling around on the floor bouncing all over Chicago? Fortunately when I got back to my room that night, it was laying on the bed where I had left it. I was relieved, to say the least. Now there's Zomm. It's brilliant in its simplicity. The idea was conceived by a mom who kept hearing friends and her kids complaining about losing their phones. It connects to your phone via Bluetooth and is attached to your keychain. It sounds an alarm if you get more than a few yards away from your phone. It also provides call notification with full mobile speakerphone functionality, provides a panic button and calls emergency assistance from anywhere in the world with just one press of a button. The device is ingenious and will be available in summer 2010. You can even preorder them for $79.99 from the Zomm website. Very cool!!! Today Nintendo announced the next big thing for handheld gaming. Since it was launched in 2004, the Mario folks have been making and selling millions of their DS portable gaming system. While at one time it was thought Sony's PSP would conquer this market, the DS became the device that it seemed every kid had. Now comes the next generation the 3DS which promises a 3D gaming experience with no glasses. Supposedly using something referred to as "naked eye 3D using a parallax barrier technique developed by Sharp Electronics". From what I can glean, this technology is already being used in some types of mobile phones in Japan. Nintendo Co., Ltd.(Minami-ward of Kyoto-city, President Satoru Iwata) will launch “N intendo 3D S”(temp) during the fiscal year ending March 2011, on which games can be enjoyed with 3D effects without the need for any special glasses. “Nintendo 3DS”(temp) is going to be the new portable game machine to succeed “Nintendo DS series”, whose cumulative consolidated sales from Nintendo amounted to 125million units as of the end of December 2009, and will include backward compatibility so that the software for Nintendo DS series, including the ones for Nintendo DSi, can also be enjoyed. As I usually do, I'm beta testing the next version of Eaglesoft. This release promised some updates to the front desk that should be welcome to most users. I did the install of the new software Monday evening and while it was time consuming, every workstation updated without a problem. I noticed this version taking a bit longer to install, but that's the way it goes frequently when more than just cosmetic changes are being made. One recommendation I can make to anyone installing a program on multiple computers on a network. Rather than going from machine to machine with a CD, copy the CD to your server or a speedy workstation and then do the installation across the network. This allows you to have several computers updating at the same time. It's also handy in case you cant' find your original installation CD. You can always go back to the copy on the server and install from that just as if you had the CD. As someone who spends a fair amount of time on the road, I'm always on the hunt for things that can make road warrior life easier/less stressful. I was really excited when I came across the Zipcharge. The idea is pretty cool. 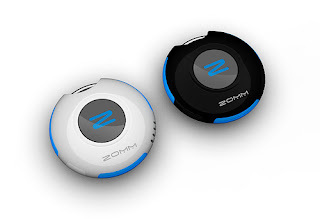 The device comes with tips that will charge almost any gadget you might have. Cool, you say, but there are lots of charger products that do that... and you're right. But the Zipcharge takes this to a whole different level. At Freeplay we travel a lot so need every portable device imaginable to keep us in touch or to entertain .......... all of which seem to run out of batteries at the most inconvenient times and in the most inconvenient places. Inside the ZipCharge is the very latest battery technology. It’s all clever nano physics stuff that you need a very big forehead to understand. We have quite a few people in our company like that. Our state of the art battery chemistry and control electronics charge 4 times faster than a lithium-ion battery so you can get mobile again in a flash! Sometimes I just stumble across something and I think, "Wow, that's a simple idea with great application!" The Magnogrip is just such a product. The device is one of those slap yourself in the forehead products that forces you to say, "Of course! Why didn't I think of that?" Anyone who has ever dropped a screw or had someone stand there to hand you nails because you didn't have an easy place to keep them will appreciate the simplicity and ease of the Magnogrip. The company makes an entire line of wearable magnetic products to help you keep track of all those little metal items you might be using at your job or in your home. These products are smart & affordable as well. As the arrival of "pad computing" approaches (Apple's iPad will be available April 3), other companies that have been announcing similar solutions are beginning to confirm their specs and prices. One of the more intriguing non-Apple devices is the HP Slate. The device is confirmed to run Windows 7, have USB ports, a memory card reader, support Flash (unlike the iPad) and have a webcam. Those are all nice features and definitely things that the iPad is known to not have. The price from HP will be in the $550 neighborhood which isn't outrageous. I'm still wondering exactly where these devices will fit into our everyday usage. Tablet PC's with no keyboard have been around for a few years now and are still a niche product, especially the ones with no keyboard. I have an iPod Touch and I like it, but I don't think that I'd want it to be my primary mobile computing device, especially since my MacBook Pro isn't that hard to carry. My plan is to definitely get into the Pad/Slate fad but I'm really interested to see where all of this goes. Thanks to the good folks at Lexi-Comp. The following info was in their March 2010 Dental e-Newsletter. As dental professionals we're often "caught in the middle" in some areas. Perhaps none is so well known in the profession as prosthetic joint premedication. The guidelines surrounding this situation have changed frequently over the last few years and many dentists have been left confused and without much science to help in the decision making process. Mayo Clinic study shows that dental procedures are not a risk factor in prosthetic hip or knee infections. Authors call for reconsideration of administering antibiotics to all patients with prosthetic hip or knee joints who undergo dental treatment. A report from the Mayo Clinic, published in January, described a large case-control study which examined the association between dental procedures - with or without antibiotic prophylaxis - and prosthetic joint infections. The study found no increased risk of prosthetic joint infections after dental procedures. And to top that, the study found that antibiotic prophylaxis was not associated with any reduction in risk of infection. The study data indicated that there is no need for antibiotic prophylaxis in patients with total hip or knee replacements undergoing dental procedures. This report comes on the heels of the recent information statement by the American Association of Orthopaedic Surgeons (AAOS) that advocated using antibiotic prophylaxis in all patients with a joint prosthesis. The Mayo Clinic study was designed to determine whether dental procedures, with and without antibiotic prophylaxis, are risk factors for prosthetic hip or knee infection. It was designed as a prospective study, case controlled, in a single-institution and conducted between 2001-2006. The full report can be found in Clinical Infectious Diseases, January 1, 2010 issue. The lead author was E.F. Berbari from the Mayo Clinic College of Medicine, along with a bevy of authors, some of which were from the Department of Periodontics, Burnsville, Minnesota, and the Department of Endodontics, Virginia Commonwealth University. There were 339 case patients and 339 control patients evaluated between December 2001 and May 2006. Case patients were those diagnosed with prosthetic hip or knee infections who were hospitalized at the Mayo Clinic. The control subjects were patients with prosthetic hips or knees with no infections, but who were hospitalized for: (1) an arthroplasty of a different site or side of the index total hip or knee arthroplasty, (2) for aseptic revision of the index arthroplasty, or (3) for other orthopedic procedures. Dental records were obtained from each patient's dentist. Dental procedures were categorized into low-risk and high-risk procedures. Low-risk procedures included restorative dentistry, dental filling, endodontic treatment, and fluoride treatment. High-risk procedures included dental hygiene, mouth surgery, periodontal treatment, dental extraction, and therapy for dental abscess. Hip or knee infections were determined using routine microbiological techniques that isolated the bacterial flora. In addition, a dental propensity score was calculated for each patient that predicted the propensity of each patient to visit a dentist. The primary risk factor was whether a patient had a high risk or low risk dental procedure and whether, at the time of the procedure closest to the study date, the patient had antibiotic prophylaxis. The risk factor was defined at 4 levels: (1) patient did not have dental procedure in the observation period (reference level), (2) was an edentulous patient, none of whom had a dental visit , (3) patient had a dental procedure without antibiotic prophylaxis, and (4) patient had a dental procedure with antibiotic prophylaxis. The total numbers of patients enrolled in the study were 339 case patients with prosthetic hip or knee infections and 339 control patients with prosthetic hip or knee replacement but no infections. There was no increased risk of prosthetic hip or knee infection for patients undergoing a high-risk or low-risk dental procedure who were not administered antibiotic prophylaxis (adjusted odds ratio (OR) 0.8; 95% confidence interval (CI), 0.4-1.6), compared with the risk for patients not undergoing a dental procedure (adjusted OR, 0.6; 95% CI, 0.4-1.1) respectively. Of the case patients, 292 were dentate individuals and 47 were edentulous. Of the control patients, 313 were dentate individuals and 26 were edentulous. Among the dentate case patients, 192 (66%) had undergone a low-risk dental procedure over a 2-year observation period. Among the dentate control patients, 161 (51%) had undergone a low-risk dental procedure over the same 2-year observation period. In addition, 164 of the case patients and 146 of the control patients had undergone a high-risk dental procedure over the 2-year period. The status of oral health was then compared between case patients and control patients during the 24 months that preceded the enrollment date. Among dentate case patients, the mean number of tooth brushings per week (mean + standard deviation) was 11.7 + 5.7 for case patients and 11.9 + 5.5 for control patients. Eighty-eight of the dentate case patients had >1 dental hygiene visit; 152 of the dentate control patients had >1 dental hygiene visit. Statistically, it was determined that there was no difference in the risk of developing prosthetic hip or knee infection between a patient with at least 1 dental hygiene visit relative to a patient with no visits. Among the 339 case patients, 259 (76%) had a diagnosis of prosthetic hip or knee infection established within 10 days before or after the study date. Staphylococci were the most commonly encountered organisms isolated from the infection sites. Thirty-five (13.5%) of the prosthetic hip or knee infection cases were associated with bacterial flora of potential oral or dental origin. Low-risk and high-risk dental procedures performed within 6 months or 2 years of the hospital admission of infected prosthetic joints were not significantly associated with an increased risk of prosthetic hip or knee infection, compared with no dental procedure. Odds ratio (OR) estimates were used to assess the effect of antibiotic prophylaxis on the risk of prosthetic joint infections. Low-risk and high-risk dental procedures with antibiotic prophylaxis were compared with the same risk procedure without prophylaxis. The OR estimate was 0.7 (95% CI 0.3-1.5) for low-risk procedures and 0.7 (95% CI 0.3-1.4) for high-risk procedures performed within 6 months of hospital admission. The OR estimate was 1.2 (95% CL 0.7-2.2) for low-risk procedures and 0.9 (95% CI 0.5-1.6) for high-risk procedures performed within 2 years before hospital admission date. These odd ratios and 95% confidence limit values indicated no significant differences between the risk of prosthetic joint infections with and without antibiotic prophylaxis. The 35 patients with prosthetic hip or knee infection associated with dental flora pathogens were compared to a randomly selected group of 35 control patients. The data showed no increased risk of total hip or knee infection regardless of the use of antibiotic prophylaxis. There was no increased risk of prosthetic hip or knee infection for patients undergoing a high-risk or low-risk dental procedure who were not administered antibiotic prophylaxis compared with the risk for patients not undergoing a dental procedure. Antibiotic prophylaxis in high-risk or low-risk dental procedures did not decrease the risk of subsequent total hip or knee infection. The results of this large, prospective, case-controlled study at the Mayo Clinic showed that the use of antibiotic prophylaxis prior to dental procedures did not alter the subsequent risk of prosthetic hip or knee infection. The ADA/AAOS 2003 advisory panel recommends that antibiotic prophylaxis be considered in those patients who are believed to be at increased risk, and that prophylaxis is not needed in otherwise healthy patients after two years of implant surgery. The recent information statement by the AAOS (see May 2009 Clinical Perspective) has advocated using antibiotic prophylaxis in all patients with a joint prosthesis. This Mayo Clinic study suggests that the risk of prosthetic hip or knee infection following dental procedures is not increased in those groups previously identified as being at risk. The majority of prosthetic hip or knee infections are due to staphylococci. Bacterial species from dental procedures include viridians group streptococci, beta-hemolytic streptococci, and gram-positive anaerobes, species not ordinarily associated with prosthetic hip or knee infections. Poor dental hygiene, periodontal, and periapical infections probably produce bacteremia in the absence of dental procedures. In the Mayo Clinic study, the authors indicated that patients with >1 dental hygiene visit were 30% less likely to develop prosthetic hip or knee infection. The authors' suggested that the reported prosthetic joint infections attributed to dental procedures were more likely to have been caused by bacteremia related to routine daily activities than by bacteremia related to dental procedures. In view of the previous statement, the authors emphasize that it is inconsistent to recommend prophylaxis of prosthetic hip or knee infection for dental procedures but not to recommend prophylaxis for the same patients during routine daily activities. Of course, a recommendation for universal prophylaxis for routine daily activities is impractical and impossible. However, it is important to emphasize that maintaining good oral hygiene and eradicating dental disease is a key to decreasing the frequency of bacteremia from routine daily activities. Prosthetic joint infections occur in 0.3% to 1% of patients undergoing total hip arthroplasty and in 1% to 2% in patients after knee arthroplasty. Most of episodes are sequalea of Staphylococcus aureus sepsis, skin infection, or infections of the urinary tract. Although it is conceivable that a small portion of the infections are caused by transient bacteremia during dental procedures, clinical experience does not favor this hypothesis. The present statement by the AAOS recommends that clinicians consider antibiotic prophylaxis for all total joint replacement patients prior to any invasive procedure that may cause bacteremia. Physicians and dentists will follow these latest recommendations. But here are the consequences: general prophylaxis increases the unjustified use of antibiotics, the risk of adverse effects (toxicity and allergy) will probably outweigh any prevention of prosthetic joint infection, and the dentist could be sued for not giving antibiotics according to the AAOS guidelines. Clear conclusive data obtained from clinical studies can help in resolving the question of whom to premedicate with antibiotics. This editorial reminds the physicians and the dental community that the Mayo Clinic study has the potential to reassure the responsible physicians and dentists that antibiotic prophylaxis is not needed for all patients with total joint replacement prior to any dental procedure and to convince individuals with joint replacement that meticulous dental hygiene is important. At the recent Chicago Midwinter Meeting, I tweeted about the announcement by Dentsply of their new alginate replacement Algin-X Ultra. I was fortunate enough to be at the Dentsply Fellowship when it was announced and I asked if it was for public dissemination. When I was told "yes" I grabbed my Pre and someone in the back of the room shouted out "he's going to put it on Twitter!" This is a great time to be a writer. Between the magazine, this blog, and Twitter I can get so much more info to my readers than I've ever been able to before. Anyway, back to Algin-X Ultra. The material is a PVS that handles very much like a light to light medium body material. It's spearmint flavored and comes in either 50ml automix cartridges or 380ml cartridges for mixing in Penta type units. Our personal preference has been for the Penta mixing as it's just so much easier. 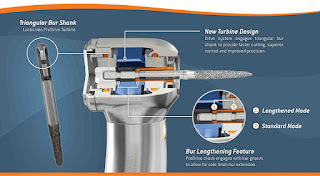 The material is very accurate and the best part is the fact that it is a PVS. This means it maintains dimensional stability for 14 days and that it can be used for multiple pours with no drawbacks. We've been using it for study models, sports mouthguards, and as the preliminary impression for fixed prosthetic provisionals and have been very pleased with its handling and results. It's available now through your favorite dental supplier. Mine, of course, is Goetze Dental here in the Midwest. Technology permeates everything we do in modern dentistry. From composite chemistry, to handpieces (like ProDrive), to lighting. As regular readers know, I'm a huge fan of portable LED operator's lights that attach to your surgical telescopes. 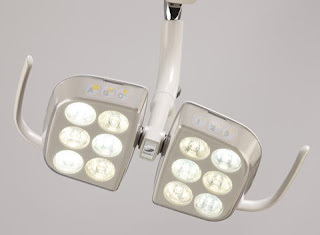 Now, even the lowly dental overhead track light is getting a high tech makeover. LED's are changing the world we live in and not just in dentistry. In the not too distant future, I'll be evaluating the EverLight from DentalEZ which is an LED track light system. For those of you who use and appreciate good lighting from a track light, this evaluation should be of interest to you. LED's have incredibly long lives (50k-100k hours) which means the track light itself may wear out before the lights themselves do. We'll be testing it out and putting it through its paces while reporting about it here, so check back regularly. Operatory lights made with 100% true LED technology, only from DentalEZ®. 1 Denise C. Murphy, DrPH, COHN, Ergonomics And The Dental Care Worker (Washington, DC: American Public Health Association, 1998) p. 301. At the recent Chicago Midwinter meeting, Progeny - A Midmark Company was showing their new Vantage Panoramic. The device has been in development for a while and I've heard good things about it from those in the know, but now it's finally here and ready for you to put in your office. Progeny is a company that makes high quality radiographic equipment. Read on for all the details. Progeny®, the leading manufacturer of intraoral X- rays in the U.S., announces the debut of the VantageTM Digital Panoramic System at the Chicago Dental Society Midwinter Meeting, Feb 25-27, 2010 in Booth 2411. Vantage is designed to bring full-featured yet affordable digital panoramic imaging to general dentistry. Powered by the latest CCD imaging technology, automatic spinal compensation and Progeny’s 3- MotionTM Imaging Rotation, Vantage delivers consistent, detailed images for analysis and diagnosis. Workflow enhancements include three lasers for precise positioning, left and right mechanical controls, four pre-programmed exam selections and the unique VantageTouchTM user interface. 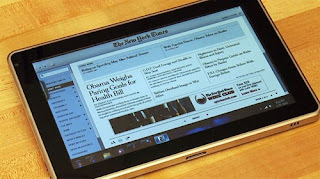 VantageTouch functions much like today’s smart phones and gives new meaning to “user- friendly”. Its intuitive, multi-touch technology allows clinicians to access any function with speed and confidence just by touching the screen. Exam set-up, real-time image preview and exam status are all quickly accessed at the VantageTouch control. Exam customization and even routine maintenance procedures are all available through VantageTouch. In addition to its many system features, Vantage also includes a dedicated computer workstation with TWAIN enabled software as standard features. The system can be interfaced with existing practice management software or images can be captured using Progeny Imaging Software. As a dentist, lighting is important to me. If you can't see well, you can't perform well. However, I appreciate that for the non-dentists out there, lighting is a problem in lots of areas. Fortunately for me, I have a couple of extremely bright LED lights that I can use clinically and then use at home if I need them. Of course most folks won't want to spend the amount of money I spent to get t hose particular lights. For everyday use, there is the LED Glove. These are a good way to see what you are doing and also not get your hands cut up in the process if you're going into narrow or dangerous spaces. I would think these would work a lot better than some of the small LED devices in hats or that attach to hats. It's also doing to beat trying to hold a flashlight. The best part is that they are affordable, retailing for just $22.95 from Amazon. Here is a video that was shot by Dentalcompare back in December. This is my usual technique for post & core placement. Enjoy! At the Chicago Midwinter Meeting Straumann, one of the big players in the world of dental implants, launched their Digital Solutions Platform. Chicago/Basel, 25 February 2010: At the Chicago Dental Society Midwinter Meeting, one of America’s largest dental exhibitions, Straumann is presenting an array of integrated computer-based technologies that have been designed to increase confidence, safety, precision and reliability in implant and restorative dentistry. Under the new umbrella brand of ‘Straumann Digital Solutions’, the company now offers state-of-the-art computer-guided surgery, intra-oral scanning, and CADCAM prosthetics to specialists, general dentists and dental laboratories in various markets around the world. Straumann is the only leading manufacturer in implant, restorative and regenerative dentistry to offer all these services. The company will also present a number of new products and features that will be launched over the course of the year. With these new innovations in intra-oral scanning, CADCAM and computer guided surgery, a complete Straumann tooth – from implant to final crown – is now available from a single provider. Straumann’s integrated state-of-the-art digital solutions now support implant placement, restoration and esthetic performance. Gilbert Achermann, President and CEO, commented: “Digitalization will impact all aspects of dentistry as digital workflows supersede labor-intensive manual processes, enhancing interfaces, shortening treatment, reducing potential for error and improving quality assurance. These benefits are expected to translate into lower treatment costs, added convenience and improved comfort for patients. Straumann is committed to bringing the new technologies to customers as part of an integrated array of flexible, reliable solutions that are designed to optimize workflows and enhance patient care”. A major drawback facing dental professionals wishing to invest in digital applications is that equipment, such as scanners, surgical guides etc., has to be sourced from a variety of manufacturers without standardization, or is part of a closed system offered exclusively by a single provider. Customers therefore face being ‘locked in’ or having flexibility without full assurance of connectivity, quality and comprehensive support services. Straumann Digital Solutions offer the flexibility of open, state-of-the-art systems together with seamless connectivity to one of the world’s leading implant, restoration and regenerative systems, in addition to guaranteed Straumann quality, service and network support. The company’s expanding portfolio of digital solutions includes three competencies: computer-guided surgery, intra-oral scanning, and CADCAM prosthetics. The combined use of 3D imaging digital design software to plan and execute precise implant placement is an emerging trend. Using a computed tomographic image of the patient’s jaw, the dental surgeon plans the position, angulation and depth of the implant on a computer using sophisticated planning software. The data are then used to produce a plastic surgical template that fits onto the patient’s teeth or gum. The template incorporates sleeves that guide drills, taps and profilers, designed for optimal implant placement. Computer-guided surgery is designed to offer the dentist a clear view of the bone condition, the position of nerve and vascular structures, and the final implant location. It simplifies the planning and execution of complex procedures, which can reduce the risk of surgical and prosthetic complications. Straumann entered this exciting field in 2009 through the acquisition of the dental business of IVS Solutions AG, a German company specializing in software applications for computer-guided surgery, including surgical template design and fabrication. Straumann is rolling out the technology internationally, announcing in Chicago that it will be available in North America in the course of this year. In addition to the benefits of user-friendliness and predictability, Straumann’s guided surgery system offers ‘open-system’ flexibility as the templates can be produced quickly and efficiently in local laboratories rather than exclusively by a central supplier. Furthermore, Straumann’s comprehensive instrument kit can be used with any Cone Beam CT scanner and can be used with other implant libraries. 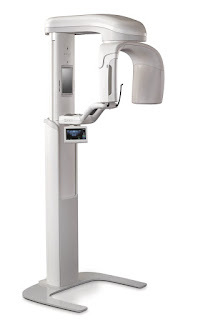 In addition to the data sharing-agreement that connects the two companies’ systems, Straumann has exclusive distribution rights for CADENT’s iTero scanning system in Europe and offers European dentists leading intra-oral scanning technology as part of its integrated range of solutions. The iTero scanner is designed to be easy to use and convenient because it eliminates pre-scan coating of teeth. Having open architecture, it can be used with multiple dental systems and thus offers customers flexibility and independence. Modern dental prosthetic inlays, onlays, crowns, and bridges are designed by computer (CAD) and milled on computerized machines (CAM). This procedure is considerably more efficient than traditional processes and can be highly profitable for dental laboratories. Central milling of CAM prosthetics on industrial machines offers a high level of precision and reliability. The company is unveiling its new advanced CADCAM system at Chicago Lab Day, which includes a new scanner that is currently in development and is scheduled to launch later this year. Speed, precision, convenience and flexibility are the hallmarks of the new system, that will be capable of scanning solid master, section-cut and antagonist models. One small practical feature is an integrated web-camera to facilitate a new level online service support. Straumann provides a comprehensive CADCAM product portfolio including scanners, software and a full range of prosthetics in modern biocompatible, durable and esthetic materials, including polymer, metals and ceramics. Through its partnership with Ivoclar Vivadent, Straumann also offers high-performance glass ceramics for high-end esthetic restorations that are designed to be indistinguishable from natural teeth. Because design software is a key component in CADCAM, Straumann regularly releases upgrades to its installed scanner base. The latest ‘5.0 IO’ upgrade includes the iTero intra-oral scanning connectivity as well as a number of new features that improve workflows and functionality. Apart from the new scanning capabilities, software and materials, Straumann will launch a number of additional CADCAM features this year, including veneers, inlays and onlays. This means that a complete Straumann tooth – from implant to final crown – is available from a single provider in conjunction with an integrated state-of-the-art digital system of solutions to support implant placement, restoration and lasting esthetic performance. As the Internet continues to evolve, more and more people are turning to their computers to find everything they need. This includes health care. In the not too distant future, Google will overtake any type of phone book in usage (and in some areas, it already has). As the Technology Editor of Dental Products Report, I get to see some cutting edge things. However most of them deal with treating patients and not how to get more patients to treat. Of course, every once in a while one of these better mousetraps in increasing your practice profile comes along. Since the fall of 2009 I've been using a service called DoctorBase that provides an incredibly unique and powerful service. The company creates a web page about the doctor and the practice that provides pertinent information and me and my practice. It's not meant to replace a practice's web page, but to work with it and as a conduit to it. DoctorBase also provides a way for patient's and colleagues to make comments about your practice so that others searching for you can see what other patients and peers think. In addition, DoctorBase can also increase the Google ranking of the doctor in Internet searches thus making your practice easier to find and contact. I've been very pleased with the results so far. Here's how Facebook works… A user posts a message to their profile. This post is then immediately distributed to all of the user's friends. Since the average Facebook user has 130 friends, this presents an opportunity for the user to make personal recommendations about products, services, and, of course, doctors! As a matter-of-fact, the average Facebook user recommends 4 businesses per month. And, since the recommendation is coming directly from a friend, it's trusted more than a random review on a review site and is 3 1/2 times more effective at creating an appointment request than a listing on Google. Here's how DoctorBase works with Facebook… DoctorBase sends a survey to your patients encouraging them to let you know how you're doing by posting a review of you on DoctorBase. When the patient posts a review on DoctorBase while logged in to Facebook, the review is automatically distributed to all of your patient's friends. Considering again that 40% of Americans use Facebook, the average Facebook user has 130 friends, and estimating a response rate to the DoctorBase survey is a very conservative 10% - DoctorBase's automation of your word-of-mouth referrals through Facebook creates 5 genuine word-of-mouth referrals for every patient in your practice. So how cool is that? It's just one more way you can keep your practice on the minds of prospective patients. For more info, contact DoctorBase. It's a digital world and your practice needs to be part of it! In my time dealing with the company I've found them to be professional and highly responsible to my needs. Changes and updates to my page and performed quickly and accurately. The best part is, it works in helping to promote your practice. This sevice is highly recommended. 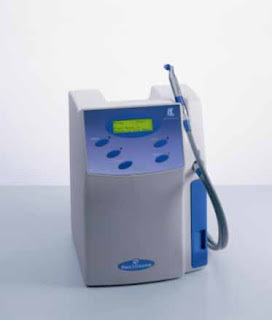 The Diagnodent was the first digital caries detection system on the market and remains as one of the best. 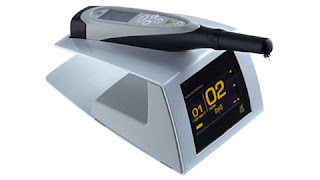 The 655nm diode laser measures caries fluorescence and gives the doctor and patients a digital readout and audible signal to indicate the depth and size of cavities. A few years ago, Kavo introduced the Diagnodent Pen which was much smaller and more portable than the "Classic" style that utilized a handpiece connected by a cord to the rest of the unit. While the pen was easier to use and much easier to transport around the office, I always disliked the idea that the digital readout was facing the floor. This made getting the digital readings from the device more cumbersome and it also meant the patient couldn't see the readings at all. To fix those problems, Kavo has created a remote display that mimics the readout of the pen. The devices communicate over an infrared signal that is "line of sight". The new display was just shown at the Chicago Midwinter meeting and is available now. Contact your Kavo dealer or your local Kavo rep for details. On Friday, I got a chance to tour the newest product from Dental Learning Centers, ImageCentrik. Dennis Braunston, who founded the company has a real passion for photography and helping doctors achieve the very best they can with a minimum of effort of their parts. His philosophy has always been to make dental photography simple enough that anyone in the office can do it... and do it well. DLC has sold easy to use camera kits for some time now, but that was only the beginning. Now DLC has moved forward into the realm of imaging software with ImageCentrik. It keeps with the companies philosophy of ease of use and great results. The idea behind the software is a good one. Take the necessary components that anyone in dentistry needs to make their photos outstanding and provide only those tools in an easy to use interface. From my demo on Friday, I'd say they'e nailed this one pretty well. The image editing is great and easy to do. The interface is slick and simple. It even provides pre-setup templates that allow for drag and drop images and text so that reports for patients, parents, or third party payers can be easily created. Let's face it, there are a ton of image editing software programs out there. Some are great, some are so-so. What I think sets this one apart is the interface and ease of use. If you are looking for a way to make you photos editing easy, take a look at ImageCentrik. Dennis Braunston’s newest dental imaging software ImageCentrik"Presentations by Design",continues the Dental Learning Center promise to simplify and improve the dental imaging continuum. Today’s busy dental team can now create professional presentations, with consistent diagnosis content and beautiful results everytime. This all inclusive program allows practices to improve patient education and present winning presentations from simple preventive to complex restorative and cosmetic cases. The SSD or Solid State Drive just keeps getting better. WD now has this amazing 256GB monster. Granted it's not as big as some regular hard drives, but the gap is closing and when you consider no moving parts and blazing fast transfer speeds, I can see these drives being the future. Solid state drives with WD quality and reliability - Protecting your data is in our DNA. With years of experience building drives that watch over data, we understand the exacting requirements needed to keep your data safe. These SSDs are no exception. Before we put the WD brand on them, they are designed and tested in WD's Fit Lab on hundreds of systems to pass our rigorous data integrity and reliability screening. Fast data transfer - Up to 250 MB/s read and up to 170 MB/s write transfer rates allow your system to run faster so you can work more efficiently. SSDs for extreme conditions - Because there are no moving parts, these rugged SSDs deliver a high tolerance for shock, vibration and extreme environments. Perfect for notebook computers that live on the edge. Low power consumption - Translates to longer battery life for portable computers. Advanced wear-leveling - Lengthens SSD life and preserves speed with a combination of dynamic and static wear-leveling algorithms designed to overcome performance degradation that occurs as a result of continual heavy use. TRIM command support (Windows 7) - Helps maintain the SSD's performance throughout its lifespan. Native Command Queuing (NCQ) - Increases the performance of SATA drives by placing read/write commands in the optimal sequential order for the fastest execution. Advanced error correction - Enables error-free data transmission by deploying advanced correction technologies to detect and correct errors. Data integrity protection - Helps ensure data integrity and availability by preventing data loss from unexpected power loss during write operations. Compatible - Works in any system that accepts a SATA hard drive with a standard 9.5 mm 2.5-inch form factor. Novalar is the company that markets Oraverse, an injectable drug that helps the body remove local anesthetic more quickly thus allowing a patient to become "unfrozen" faster. It seems that on February 26th, the company received a letter from the FDA stating "The brochure omits and minimizes the risks of the drug while overstating its benefits". In part, the letter states: "The patient brochure is misleading because it suggests that OraVerse is useful in a broader range of conditions or patients than has been demonstrated by substantial evidence or substantial clinical experience. Specifically, the patient brochure contains the claim, “And now the safety and effectiveness of OraVerse have been successfully demonstrated through clinical trials involving pediatric, adolescent and adult patients ages 4 through 92.” This claim misleadingly suggests that OraVerse is approved for all patients ages 4 through 92, when this is not the case. FDA is not aware of substantial evidence to support efficacy claims in patients under the age of 6 years old. According to the Indications and Usage section of the PI, OraVerse is not recommended for use in children less than 6 years of age or weighing less than 15 kg (33 lbs). Furthermore, the Pediatric Use section of the PI states, “The safety, but not the efficacy, of OraVerse has been evaluated in pediatric patients under the age of 6 years old” (emphasis added)." For the full FDA letter, click here. I got a chance to see the new Cerec software version 3.8 at the Chicago Midwinter meeting last week. This update is impressive! If you are a Cerec Service Club member, you should be receiving it around May. Charlotte, NC (February 25, 2010) – Sirona Dental Systems, LLC (Nasdaq: SIRO), the company that pioneered digital impressions and dental CAD/CAM 25 years ago and the world’s leading producer of dental CAD/CAM and digital impression systems, is pleased to introduce user-friendly software developed for its CEREC® chairside system. The new software is based on Sirona’s patented Biogeneric technology. Like fingerprints, no two human teeth are identical and each tooth has its own unique characteristics. A group of researchers led by Professor Dr. Albert Mehl (Zurich University) and Professor Dr. Volker Blanz (Siegen University) have unraveled the rules that shape natural teeth, and these rules are based on a patient’s genetic makeup. Sirona has harnessed this understanding into the new Biogeneric CEREC 3D software. Version 3.8 of the CEREC software enables dentists to create lifelike reconstructions – even while working with completely damaged occlusal surfaces. On the basis of a single intact tooth, the program extrapolates the natural morphology of that tooth to the patient’s damaged tooth structure. CEREC 3.8 software can be used for all single-tooth restorations and for three-unit bridges. Currently, all occlusal design approaches are based on limited dental libraries and databases containing data records of various standard teeth. Conventional CAD/CAM programs retrieve a matching tooth from the archive, and then generate a design proposal for the given clinical situation. The user then manually edits and adapts this proposal. No objective principles exist to justify this selection, and using matching databases can be subjective and time-consuming. The Biogeneric design feature will replace the “dental database” feature in previous CEREC software versions. With Version 3.8, it will be possible to easily create crowns, veneers, and anatomically sized bridges. The user will simply require an intact reference tooth of the similar type – i.e., anterior or posterior. The time-consuming process of selecting tooth morphology from dental databases has been virtually eliminated. Moreover, due to the standardized and largely automated routines, the software is easy to learn and use. For more information about any of Sirona’s CAD/CAM and digital impression solutions or to schedule a free demonstration, call your local Patterson branch, 800-873-7683, or visit www.cereconline.com. A few years ago, the Healozone product was released by Kavo as a way to arrest and remineralize caries. The device was sold in several countries and submitted to the FDA here in the states. For several years the FDA evaluation was said to be "ongoing" with approval sometime "in the future". The idea of being able to seal around the tooth with a handpiece and then be able to apply pressurized ozone into areas of decay to kill the bacteria seemed promising... at the time. One of the things I heard at the Chicago Midwinter meeting this past weekend is that Kavo is now pulling the Healozone device from the market worldwide. This rumor came from 2 reliable sources, however they are outside the company. I'll be contacting Kavo shortly to see if I can verify. In the not too distant future you'll be seeing my picture showing up in ads for the Gendex CB-500. In fact, if you were in Chicago, you may have seen it already as the Midwinter show was the launch of the ad. I've been using the machine for about 18 months now and really love it, so when Gendex approached me about lending my mug to their ads, I felt it was a good fit. But fear not, lest you be thinking that my objectivity is now tainted. I'm pledging to do the same job as before. Looking for the best and most effective products that will help improve the lives of our patients and that includes the entire category of 3D.